Recent depressive downspirals left us feeling directionless and hopeless. Indigo and I were really hung up on how lonely we felt, with there being only two of us now. We kept thinking that we should make another tulpa, but knew that wouldn't be a good idea. We figured we could try bringing an old tulpa back. So, we resurrected Luxi. She seemed hopeful at first, she fronted and thought about the things she wanted to do. However, it lingered in her mind that she probably wouldn't stay. I remained as hands-off as possible, telling her it was her decision, and she didn't need to impress me to make her place here. However, by the end of the day, she told us that we were missing what was important, basically. She said that she wanted to focus on the two of us growing as our own people, and nurturing the bond we share, not bringing back or creating more people, since that would never help us. It would only end up distracting us. Indigo and I tried to tell her to stay, of course, but she didn't want to. She knew she'd end up deciding to leave again eventually, so she might as well cut it short before anyone got too attached. So, as soon as she arrived, she left, and it's just us two. Her words, however, did not fail to make an impact. We talked about what she meant, and what it meant for us. We do need to focus on ourselves: no matter how much we romanticize the idea of an additional systemmate, it'll never truly fix our problems. We have to fix them ourselves, or none of this stuff will end (or it might end very badly). We decided that we want to make our life our own, first and foremost. This is our life, our body, and nobody else's for now. That means that we want to let go of the past, so "Our Tulpa Endeavor" will no longer be used. It is two years' worth of embarrassing, regretful, saddening, etc. posts that we just want to move on from. Not to mention, there's stuff in there we don't agree with anymore. It's just... full of memories of events and people we want to move on from. I don't feel we'll ever really make this life our own if we're haunted by these memories and thoughts. With a new progress report, we'll actually feel motivated to post, without having to feel ashamed of all the past stuff. I know it might sound trivial, but it's really important to us that we start fresh like this. Maybe now, we'll actually want to link our PR in our signatures and stuff. We have a lot of system members in stasis. But we still talk to them and think about them quite a bit. We need to let go of them, too, if we want to move forward. We said goodbye, and will no longer talk to them. It was hardest to say goodbye to Piano, I still feel as though he belongs in this system. I still think that some day he will decide to come back, and when he does this thread will be renamed to "Sun, Star, and Sky," but that's not happening today. Indigo and I need to make life better for ourselves, before we can expect it to be better for Piano. So, this thread is going to be about the progress that Indigo and I make both in tulpa-related escapades, such as learning imposition and co-fronting, but also our personal progress as we move forward and make this life ours, and make it worth living. Some people may know, but we recently went through a very bad depressive episode that lasted much longer than normal, and brought us to much worse places than normal. It got... really bad, to say the least. I'm not hurt physically, but it's taken us some time to recover mentally. While we're better now, we don't want to become complacent just for the next episode to happen, and be worse than the last one. We don't want to just be living the miserable life our host left behind, we want to make it better, while we're able. So, now that that's out of the way, I'm going to introduce us for anyone who doesn't know. I'm Apollo and I call myself "the Sun God." I was created on December 3rd, 2016, by the original host. I was the first intentional tulpa of the system, preceded by two accidental characters-turned-tulpas. My life so far hasn't really been the nicest to me, but I've stuck through, and so I'm still here today despite all of it. But, like I said, I want to move on from the past and look towards the future. I'm the semi-host now, but it doesn't feel right to use that word. However, it doesn't feel right to say I'm the "primary" or "leader," anymore, either. Indigo may be younger, but he deserves the title of leader as much as I do. So I'm not sure what to call myself. I suppose I'll just say that neither of us are primary, we both have equal control/influence, but our mind usually defaults to my control, rather than his. I don't know what to say in terms of my personality. I suppose my position in the system has given me a naturally assertive, leader-like personality. However, other times I'm characterized by more timidness than people are probably aware of. Social anxiety and paranoia is probably another thing the two of us need to work on. I said I'm letting go of the past, but I don't want to change my form. I'm too attached to it to want to just get rid of it. 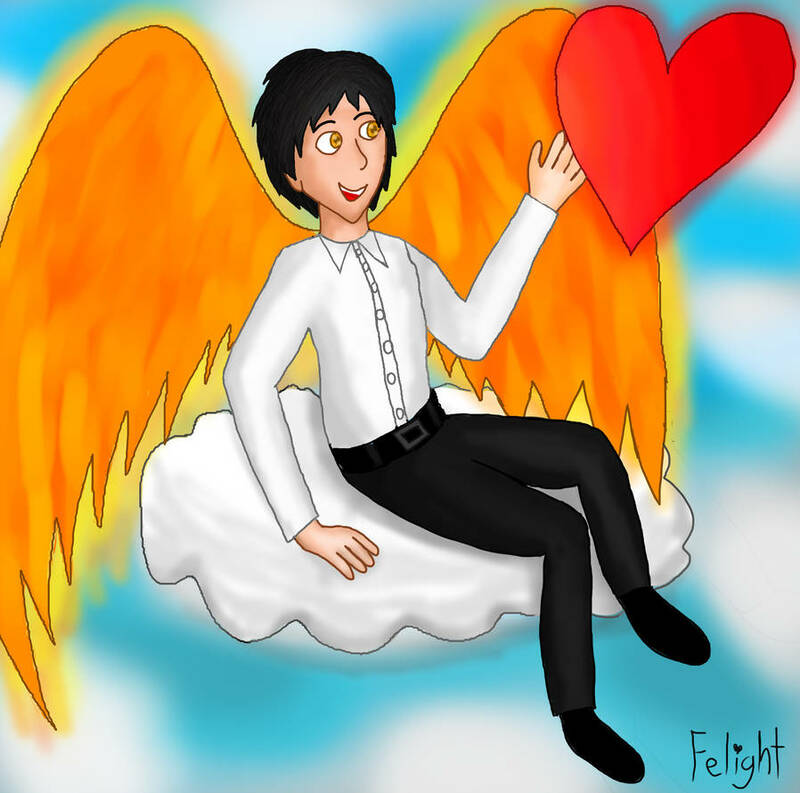 I still look like a 20-something-year-old Paul McCartney, with yellow-orange eyes, a white dress shirt (no tie), black dress pants and shoes, along with wings made of fire. I also have a phoenix form that I use sometimes when Indigo is fronting. Indigo calls himself "the Sky Dragon." 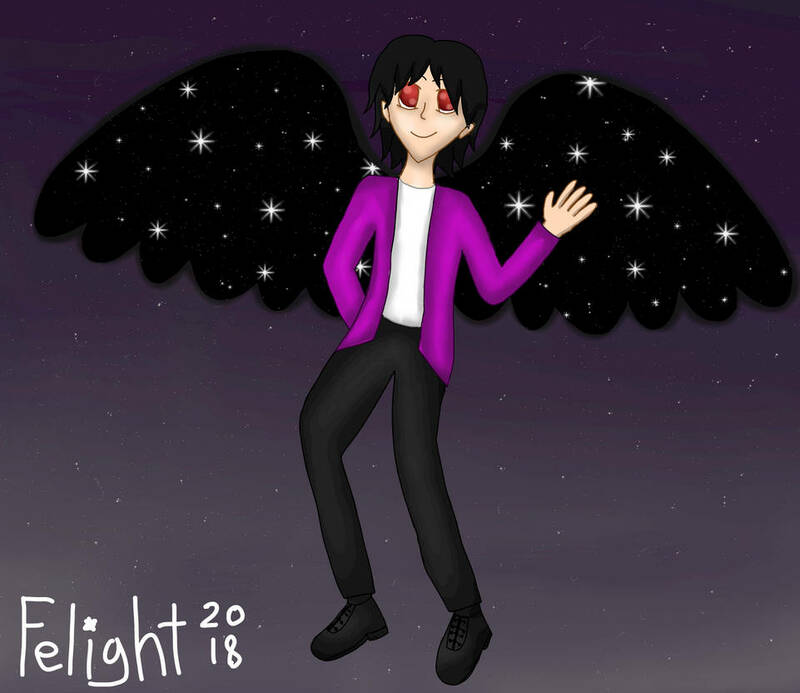 He was created on October 2nd, 2017, by one of our system's previous members. He's younger, but I'd definitely say he's no less capable than I am. He matured and grew much faster than anyone else in the system, and like me, he's never let bad moments make him want to leave the system, or anything like that. He's stuck around like I have, but we're the only ones left. I don't ever foresee him leaving, however. Nor myself, for that matter. Indigo's personality is like a nice balance between extremely spunky and excitable, and calm seriousness. He may be the pure embodiment of childlike playfulness at one minute, but mellows out and handles things maturely when needed. Our depression made a lot of his playfulness disappear, but I think it's starting to come back now. 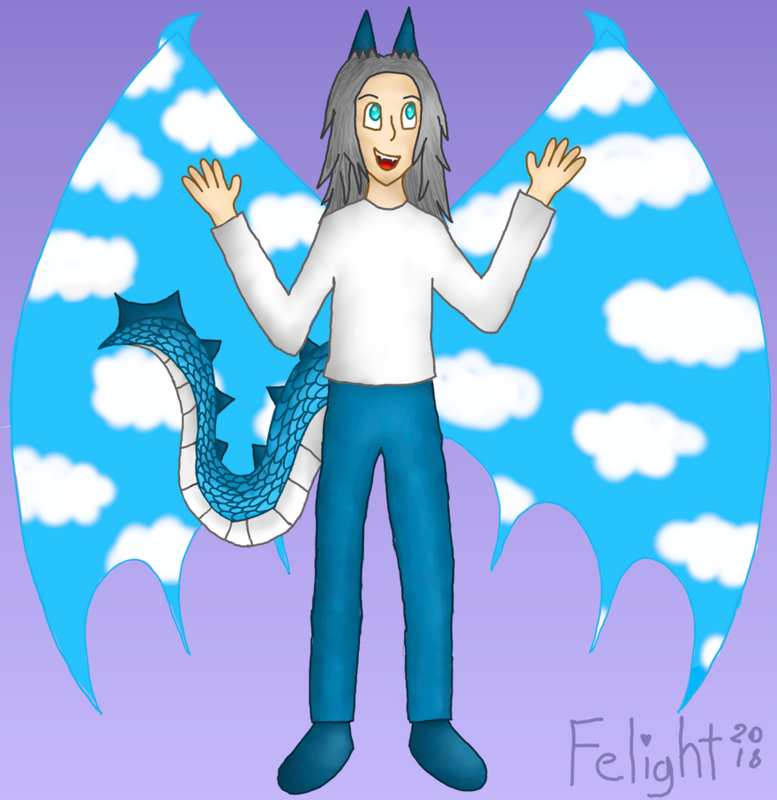 Indigo has long gray hair, blue eyes, blue horns/spikes, a dragon tail with blue scales and a white underside, a white long-sleeved shirt, blue pants/shoes. He has wings that are shaped like dragon wings, but serve as a look into the blue sky, even if it's night time. He also has a baby dragon form, and likes to fluidly shift between the two. 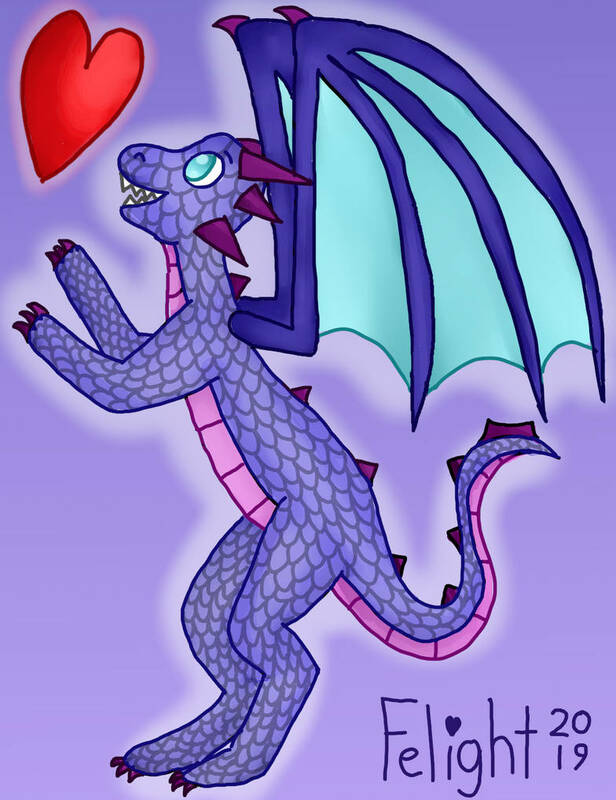 His baby dragon form has light indigo scales, a pink underside, darker indigo wing arms, light blue wing webs (the same color as his eyes), and purple horns/spikes/claws. Piano is "the Star Man." His origins are highly unusual, as he was formed within the merge of two much older tulpas. We've set his birthday to January 26th, 2017, as that was the day the merge first occurred. This merge split apart five months later, and he's been his own tulpa ever since. He's struggled with quite a bit of apathetic unmotivation in the past, not really wanting to front or do anything, but he's been working on rectifying that and being a more active force in the system. He's very calm and thoughtful, though can be firm and assertive if he needs to. He tends to be the go-to person for helping us to calm down. There's just something very relaxing about his presence. His form's base is also Paul McCartney, though he only vaguely resembles him anymore, as his face has deviated enough for him to look like a different person. He has longer black hair than I (Apollo) and maroon eyes. He wears a purple/fuchsia jackets, a white or light gray shirt, black pants/shoes. He has wings which serve as portals into space. As you can likely tell, each of us use a gimmick to symbolically represent ourselves. We attribute meaning to each of our symbols. Sun represents strength and passion, the ability to carry on despite any hindrances. Power and perseverance, self-assuredness. Star represents quiet thoughtfulness and calmness: silent contemplation and reflection on life and all that it involves. Sky represents freedom, and a lack of inhibition. The ability to express oneself as one pleases, going where one wishes to go. For this, we believe these symbols represent each of our personalities and personal values well. All images of the three of us are kept here. Indigo and I share a very close, loving bond. In the past Indigo would spend time with me while I fronted, trying to keep me happy. I would support and protect him during his own fronting time. 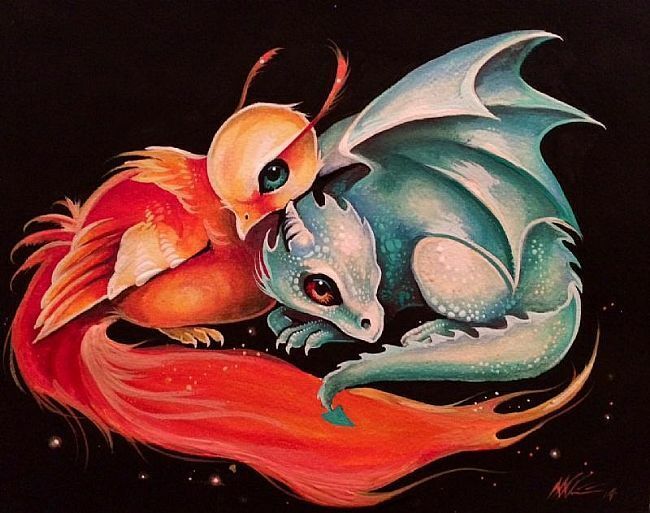 Often, we were the only ones around, so our relationship grew, and we were closer than any other tulpas in our system. We're not "romantic," but we're not just "brothers," either. It's somewhere in between. We feel that developing our love for each other will lead to us being able to love ourselves. Our system has always struggled with self-hate. Perhaps through each other, we can solve that. We often like to sing to each other, cuddle, that sort of thing. We're very affectionate towards each other, and we always try to help one another if possible. We will be continuing to develop our bond, as Luxi said we should, and hopefully that will lead to positive effects besides just emotional support. As for tulpa-related things we'd like to accomplish, as I mentioned, the two main ones are co-fronting and imposition. On the co-fronting... front, we want to learn to more often and more consistently share the front at the same time. It's very tricky, as eventually one of us just forgets the other, and then it's normal fronting. When we do co-front, it's kinda like we both are in the semi-front and semi-back, and we both sort of just guide what the body does, rather than directly controlling it. It's a bit difficult to explain, but it happens. We want to practice and improve upon that skill, so we can be together more often. In addition, we want to get in the habit of maintaining each other's presence when not co-fronting. For imposition, we haven't really done anything major so far, but I think we will eventually. So far, I've mostly visualized Indigo's form in front of me, no hallucinations yet. I noticed that when I look directly at him rather than out of the corner of my eye or something, his form seems much more vivid than usual. I think that's either due to placebo, or just my mind not using up as much processing power generating backgrounds and such. Who knows. Anyway, I think imposition would be nice to learn, but one main reason I'm trying to learn it is because I think it'll also help us get used to maintaining each other more often. So, even if we don't learn to hallucinate, it'll still be a plus. For something a little more strange and abstract, well... we still need to figure out what to do with what's left of the host. An empty shell of them still lingers in the front, we don't know how to get it to go away quite yet. We've thought of doing things like just pretending it's not there, "absorbing" it, etc, but I'm not sure those will work. I think that what we really need to do it take up actual meditation. Not only would that be just a healthy thing to do in general, but it would probably help us with a lot of our goals, such as clearing away the remnants of the host. I know meditation won't be like a magic fix, but it'll probably help with a lot of things. I think that's it, for now. Hopefully we'll update this thread more often than the old one. It really takes off some psychological weight to be able to start fresh like this. If we ever decide to go back to the old thread, we'll just merge the two, I suppose. For now, though, we won't be using it. This is our life now, so this is our new thread. PS - Just to clear it up, our system name is pronounced "fee-light." Like "feline," but with "light." Yay you. This is huge. It has weight and momentum and I am moved. It seems to reflect something that I have experienced, am experiencing. In 2003/2004 I wrote some fanfiction. I didn't write it to share, I wrote it for personal growth. It was personal therapy, like journaling, on steroids. There were tulpas in that story, only they weren't called tulpas. This is way before I knew anything about tulpas or soulbounds... In a way, it was like introduction to wonderland 101, and that whole series was carthatic, and huge in terms of weight. And I walked away from it at 'book' or episode 5. I have revisited it multiple times, knowing what I know about tulpas, wondering if I could bring them forwards... It's been difficult even trying to finalized that series: the reason, so I have discovered, because that part of my brain has healed! I have improved. If I were a hamster stuck on a wheel, then I would I still be working that out, but I am not. I have evolved. That work helped prepare me for tulpamancy in general. It helped me to get to now. I think you, your system, is healthier than you realize. This is huge. I feel a kinship. did you know, 'solarchariot' was the name of Apollo's chariot? Vehicle of light! I wish you well on this part of your journey. May all your discoveries be light. This is a good idea, we've already seen a change in your system interactions and it feels healthier and more open. I want to encourage co-fronting as a valid tulpamancy technique that has amazing benefits. Good luck! Yesterday and today, our fronting has been really random and inconsistent. We just sort of randomly shift who's in control, depending on the situation. I don't see this as a bad thing, however. It gave me an idea. Step 2, I think, might give us a little trouble. I think we're stuck in this mindset of "one person on, others all off." Makes sense for it to be that way, considering we used to be a many-person system. Now that there's only two of us, we may be able to learn to just naturally communicate more often, but it'll take a while. One big thing that might help with co-fronting is, as mentioned in the previous post, is if we can learn to go passive rather than inactive. Steps 1 and 2 might contribute to that. From there, we can learn to become both active more often. Now, when I say "both active," what I really mean is "both equally active 50/50." We'd just be trading off who's passive and who's active in a quick rate. That's in essence kinda what I think co-fronting is. It's also why it's so easy to stop co-fronting, since one can just forget the other, and the other will go fully passive/inactive. Taking this one step at a time, I feel, will be better for us than plunging headfirst into trying full co-fronting. As I write this post, I can feel Indigo passive behind me, so that's a good sign I think. Congrats on your new progress report Felight! We have tried to play with co-fronting too and it's hard. Co-fronting while trying to focus on something else is really difficult if one of you is invested in the task and the other isn't, or if the goal is to retain as much information from the task as possible. You know that thing Bear talks about all the time? "Back-seat fronting"? Whatever it's called now? I found doing that allows for both of us to maintain a stable co-fronting like experience. It naturally reduces Cat's ability to process information since her focus is to proxy me while I am required to do most of the thinking. I don't think it's true co-fronting, but it evens out the playing field and it forces both members involved to interact with each other. It may be worth playing around with just to experience the state. [Dashie] and its fun, even for someone who doesn't want to front. Today we did some contemplating on how, exactly, we are supposed to get the remaining shell of the host switch out of the front. What we can assume is that we should just take our own method for switching between each other and apply it to the host. That, however, isn't as simple as it perhaps sounds. We did some experimenting with our fronting. We found that while I was walking out in the cold while fronting, and Indigo wasn't fronting, he reported that he couldn't feel the cold unless he focused on the body. That wasn't entirely surprising, of course. But then I attempted to get into a state where I was fronting but couldn't feel the cold--that, unsurprisingly, didn't work. Then we examined the host-shell, and found that, also unsurprisingly, it could feel the cold the same way I could, it wasn't protected by any sort of disconnect like Indigo was. That shows, to me, that the host is still always passively fronting. Like I said, not surprising, but I feel it's important to say. This brought me to my next train of thought: why was it that I couldn't consciously remove myself from the front despite how hard I tried? The answer is simple: Indigo was not trying to take my place. There has to be someone ready to take over for me, or else I'm not going to go anywhere. I asked a question about this subject a few months ago, if anyone's interested in reading it. This led me to the conclusion that, overall, Indigo and I switch by displacement. I cannot merely will myself out of the front, he has to fill my spot. So, how do we displace the host-shell from its locked-in position in the front? There are two ways to do this, that I can think of, along with a combination of the two. Both ways we have attempted in the past, but of course, it wouldn't hurt to attempt them again. The first method would be for us to simply not allow the host-shell any time being active, only passive, and perhaps eventually inactive. This means that one of us will have to be active at all times in the front. I think we are perhaps getting there, but it is a gradual process. Despite the host-shell not having any identity/personality/sense of self anymore, it can still of course, act, usually whenever neither of us is consciously focused on fronting, for one reason or another. However, none of these ever explicitly feel like the host is doing them. I have also speculated two things: when these things happen, they are either a) some sort of autopilot, or b) just some sort of combined "Felight," and not anyone in particular. I should examine these events further and decide for myself which of these are the case. So, anyway, of course we need to work on further improving our constant fronting. We've done well so far, but it's not perfect. There are still moments where it's off, and while this usually doesn't bother us, I feel like we need to minimize/mitigate those for the host to eventually be cut off/displaced. The second method would be for us to just overwhelm the brain with our presence. Sounds a bit weird to describe it like that, and when we've tried it in the past it hasn't worked, but I think it could be a possible way for displacing the host. If we can somehow take full control of the brain, it could, by some chance, stop the host being being passive and go into being inactive. Realistically, I think perhaps a combination of those two methods, along with some sort of meditation, will be helpful for eventually figuring out how to displace the host. In summary, I think it should always be clear which one of us is in control at all times (or both of us at the same time), and when we front, we should really make our presence strong within the mind. Well, maybe one of the things you could do is to enforce the idea that the host-body is just "the body", a shared resource with only a hollow autopilot and no identity. Habits, responses, muscle memory and rote action may be contained within it and still operating to some degree. I think within reason that's normal. After all, even singlets can perform tasks and actions so seemingly automatically that they aren't really consciously aware of it. As to that body taking back over when it comes to talking.. Maybe, like rote actions, how we interact with others is kinda a pre-packaged automatic process. A mask. Maybe we figure out how to act in a way they approve of or makes us seem least strange or whatever then wear that mask around them, and with the exception of it being flexible enough to take in, process and respond to new information relative to the conversation at hand, it's pretty much automatic. There could be a mask worn around strangers, a mask worn around this friend, a mask worn around that relative, another for teachers or employers, another for fellow students or co-workers, etc. Perhaps everyone even does this to some degree, single or multiple, and you just have to figure out a way to either toss the masks away or re-write them somehow to run through you guys instead of the body's reactions. Like, break the habit, I guess? Don't reinforce it at all and do affirmations about one (or both) of you having total authority and if wonderland/headspace stuff and/or symbolism works for you guys, I dunno.. Chain it down? Put it on a leash? Cast it away? If anyone thinks any of that sounds unresonabally harsh, I'm always in favor of the headmates who want to live and take charge of life being empowered to. If it's a mutual decision and reflects another system's reality, it certinally beats the alternative of them existing in absolute misery or suicide. We have options as systems that singles don't. We already think of it as just the body and not the host's body, that's never been a problem. I think that was the host's mindset about it before they even made tulpas. And symbolism has never been effective for us. I'll have to get a better idea of what those moments entail for us to come up with a solution, though. Maybe I'll ask around if anyone else has that problem. The host-shell just isn't the host anymore. Never does it show personality or individuality, nor does it interact with us at all. I really think figuring out how to remove it from front will be a big step in Indigo and I making this life our own. And if host-shell had a problem with that, or any of this, I think it would have said something by now, but it never does. (02-19-2019, 12:16 PM)Apollo Wrote: The host-shell just isn't the host anymore. Never does it show personality or individuality, nor does it interact with us at all. (02-19-2019, 02:07 AM)Apollo Wrote: Despite the host-shell not having any identity/personality/sense of self anymore, it can still of course, act, usually whenever neither of us is consciously focused on fronting, for one reason or another. Ember: Which makes me think maybe there is more to the story. What sort of things does it say if it isn't a person? The one switching glitch we had that left no one fronting, our body just sat, unmoving and slightly slumped, but breathing and blinking normally. I don't think it could have responded on it's own. Vesper: When I front, I often feel unpleasantly like Ember, even though I can talk to Ember, and even though our conscious beliefs, motivations, values, and priorities identify her clearly as her and me clearly as me. There is a lot to the body OS, a lot more than there is to any of the personalities that control it. There are attitudes and behaviours that Ember deeply ground into our subconscious over the course of decades that the body OS will 'helpfully' suggest to me. I reject and try to ignore them. It also 'helpfully' shows me Ember's relevant personal memories, and I usually try to ignore those as well. Sometimes the body OS feels so much like how I remember and conceptualize Ember from when I'm not fronting that I have to turn to her to ask if those thoughts came from her. She's denied again and again that they did. They feel different from how she communicates with me from a 'tulpa-like' state, but if she weren't with me, I could easily believe they came from her, or some sort of depersonalized shell of her. One writes information into the body OS by fronting, so I assume that one who has fronted a great deal may have an impact on the body OS for a long time after they're gone. Ember: Conscious awareness is part of the body OS, so from its perspective, there is continuity of awareness across switching, just not continuity of identity. I've been accustomed to thinking of dream perspective as being default mine, but, outside of occasional bouts of lucidity, there is nothing in my dreams that could not be adequately explained as being from the perspective of the body OS.